This entry was posted on July 6, 2015 at 7:27 pm and is filed under 1980s, Heavy Metal, Heavy Metal and the 1980s, Music, Rock, Uncategorized with tags British, British Steel, Classic Rock, hard rock, Heavy Metal, Heavy Rock, Judas Priest, New Wave of British Heavy Metal, NWOBHM, Rock And Roll Children, Screaming for Vengeance, The 1980s. You can follow any responses to this entry through the RSS 2.0 feed. You can leave a response, or trackback from your own site. This was once my favorite Priest. I still love it! I didn’t expect it to be as heavy as it is. I have to tick yes to everything you said. 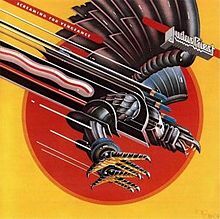 This was the first Judas Priest album I heard and it really made an impression. Love it. It is such a good album, it was the second one I heard and it made me a Priest fan forever.